Hello my name is Ray and I am an Essieholic. 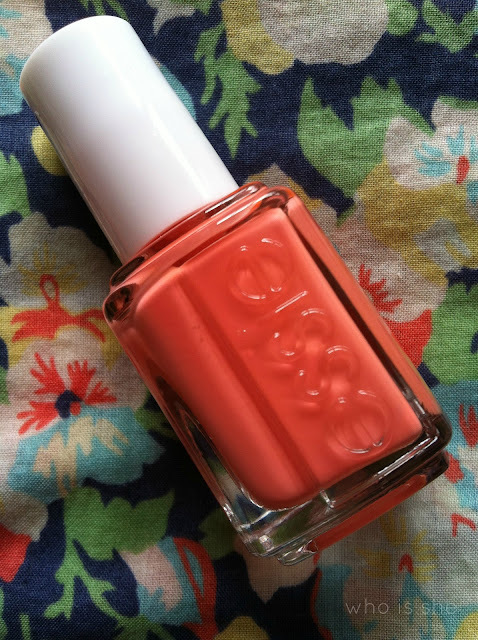 Yup the nail polish brand I vowed I wouldn’t buy into due to blogger hype has hit me hard. I honestly can’t get enough of the brand, especially the diffusion line from Boots and Superdrug. My current go to shade is the infamous Tart Deco- a simple shade which I can get away with at work and adds a simple pop of colour to any outfit. As you can see Tart Deco is a light orange shade which is very similar (I’m not saying dupe) to Models Own Fuzzy Peach and the application I find is exactly the same. The Essie diffusion line formula aims to be fast drying and the wider brush works fab on my nails- three swipes and my nail is covered. Drying time with any of the diffusion polishes takes a good 10-15 mins, whereas with the normal range drying time can take up to 30 mins for it to be fully dry. A word of warning though (and this also happens with MO FP) the polish is prone to go streaky on the second coat, so be very careful- I could have done a third coat in the pictures above although as this was for a night out I honestly didn’t see the need for a third or top coat. Although the streakness doesn't photograph well, but trust me it's present. Does anyone else find that when they use Seche Vite with Essie polishes the Seche Vite literally flakes/peels off the next day?